View of the screen from the Centre of the Caulfield Racecourse Reserve picnic facilities. 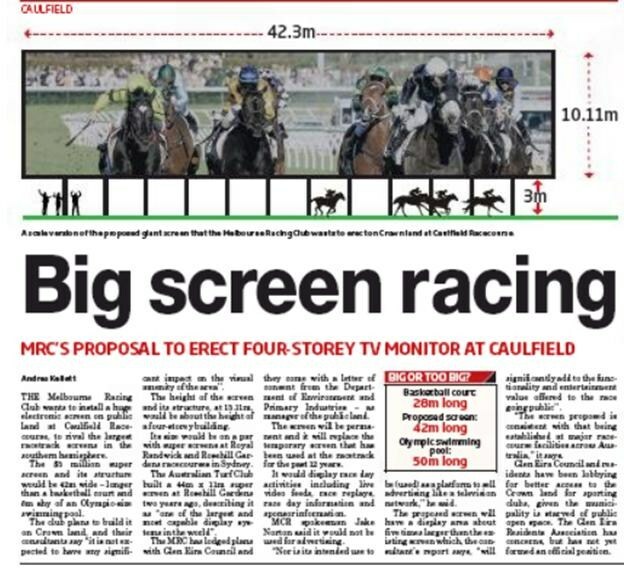 Last Tuesday’s Council Meeting (20/5/2014) granted approval for the erection of an enormous electronic screen on the Caulfield Racecourse (see below posting). The permanent screen will be located, in front of the grandstand, on Crown Land that is designated as a public park and recreation area. The screen will be used for live racing feeds on race days (27 pa) and sponsorship promotions during both racing and non-racing events. Much of the discussion, leading up to the formal vote for screen approval, related to the benefits derived by MRC and race patrons (ie. additional income stream, attractive to grandstand users) rather than the adverse visual impact on the parkland and parkland users. However, the “major” argument presented for approving the screen was that such approval would remove the MRC’s ability to argue against the future provision of sporting facilities on the Racecourse Centre’s public parkland. While GERA has reservations re the adoption of this approach, GERA sincerely hopes that approval to permanently erect a screen of this magnitude results in increased sporting facilities in the centre of the racecourse in the near future. At tomorrow’s Council Meeting, Council will vote on the Melbourne Racing Clubs planning permit application for the permanent installation of a huge electronic screen on Crown Land in an area designated for public parkland and public recreation usage. have a screen area of 427.6 sqm – larger that the designated minimum lot size for large lot subdivisions in the Neighbourhood Residential Zone. (GERA’s additional comment). 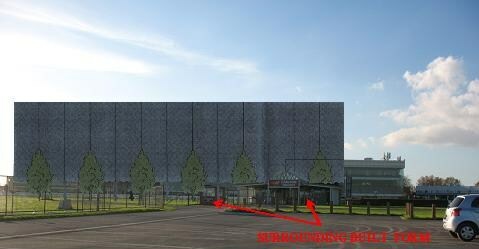 Please note the above picture superimposes the screen diagram (as per documentation presented by the MRC) on the above “before” photo. Screen positioning is aligned with the pitch of the access tunnel entrance roof. “will significantly add to the functionality and entertainment value offered to the race going public’’ by displaying live video feeds, race replays, race day and sponsor information. although the Leader Article referenced reports an MRC representative as saying the screen “would not be used for advertising”, at the Council held Planning Conference (25/4/2014) the attending MRC representative said it would also be used to promote sponsors during other events held at the racecourse. that the screen dimensions are in line with similar screens installed in other Australian racecourses. the screen is to be permanently located on crown land in an area designated for use as a public park and public recreation. the screen’s proposed dimensions have a detrimental impact on the visual amenity of the park and it’s users. This loss of visual amenity is not mitigated by surrounding built forms or proposed plantings. the predicted limited usage of the screen (ie 27 racing afternoons per year and 10 non racing event days per year) is not sufficient to justify this permanent and prominent intrusion (365 days per year) on parkland. it is inappropriate to permanently locate signage, which will also be used to promote MRC sponsors’s products and services, on publicly owned parkland. 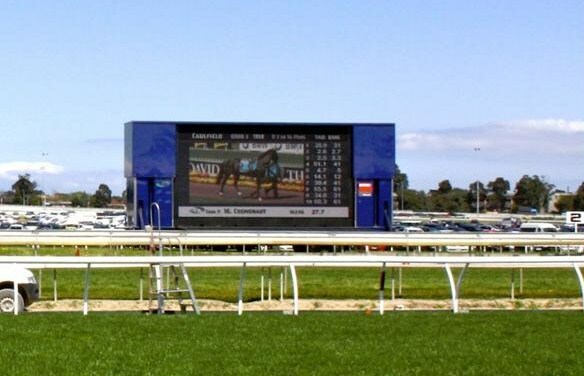 that the argument that the screen’s size is consistent with those installed at other Australian racecourses does not recognise the designated parkland and recreation usage that applies to the Caulfield Racecourse Reserve. 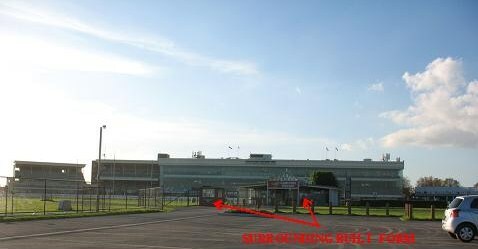 The screens referenced in the permit application are located on either crown land designated for racecourse purposes only or on free-hold racing club owned land. *A large lot is defined as being a property lot greater than 2000 sqm. CAULFIELD PARK CONSERVATORY – Gone??? Posted on May 19, 2014 | Comments Off on CAULFIELD PARK CONSERVATORY – Gone??? Last week’s Council Meeting (20/5/2014) saw some 35+ residents protest against Council’s decision to demolish the conservatory and return it to open space. 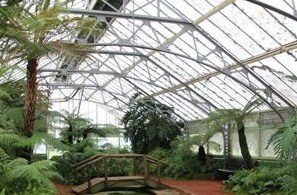 The decision (a 4 to 3 split decision) to remove the conservatory (Council Meeting 29/4/2014), came some 7 months after the previous unanimous decision to (24/9/2013) to restore and replant the landmark Conservatory. The protest involved residents entering the Council Chamber towards the start of the meeting and chanting, for some 4-5 minutes “SAVE OUR CONSERVATORY”, then departing. The 20/5/2014 decision to remove is primarily based on Council’s estimated cost of restoring and replanting ($120K) being lower than the average cost ($297K) of structural restoration tenders received (an amount of questionable significance in terms of Council’s annual $73+m budget). Re the removal decision – no community consultation occurred and no information was provided in support of Council’s $120K (restoration and replanting) cost estimate. Additionally, the comment “that if residents were aware of the cost when surveyed, the outcome would most likely have been different” (Leader Article 21/5/2014) lacks foundation and does not acknowledge that, although residents requested cost estimates be provided for the various 2013 survey options presented, none were provided. The issue of what to do with the Caulfield Park Conservatory (subject to a Heritage Overlay) has been raised 4 times in the past 4 years. Predominantly the options presented to the community have been restore, remove or convert to café. Although, each time the community has voted for restore, the conservatory has remained neglected. o promoted the survey in prominent locations within Caulfield Park. Although residents, and the Friends of Caulfield Park, requested cost estimates be provided to enable residents to make informed decisions on the various options, none were provided. o the second most preferred option being that the Conservatory be used for a native/sustainable garden (31%). At the last Council Meeting 29/4/2014 (Council Meeting Minutes – Item 9.8), the Caulfield Park Conservatory was raised once again. The Officers Report presented states that the Council Budget provided $120k for restoration of the conservatory and the average of the tenders received for the restoration of the conservatory was $297K. The explanation for this cost over run was that in “The process of preparing the tender specification and the tender process itself identified additional issues”*, which we believe are predominantly structural and brings into question the costing exercise undertaken to determine the budgeted $120K. Voting against the motion – Crs. Lobo, Magee, Sounness. Following on from the recent well-publicized and highly contentious removal of trees from Caulfield Park, the Friends of Caulfield Park are understandably aggrieved at Council’s decision to overturn (within 7 months) the 24/9/2013 decision to restore and replant – a unanimous decision that was based on extensive community consultation. The split decision to overturn was made without any community consultation and on a questionable budget estimate. contrary to the principles of good governance (GERA 2011 Governance Posting). Such principles do not support overturning a previous decision, that was based on an extensive community consultation, due to an underestimated budgeted amount. “Community engagement is about enabling the community and other interested parties to be informed and invited to contribute to Council services, events, strategic plans, issues and projects. Engagement strengthens the community by involving citizens in the democratic process and providing them with opportunities to express their points of view. Participation in civic life is recognised as being central to good health, developing strong and supportive networks and creating a positive community spirit. By engaging with the community, Council acknowledges the right of citizens to have their say and get involved with local issues that affect them, their family and their community. It also enables Council to meet the needs of the community by ensuring that planning and decision making is based on an understanding of the needs and aspirations of community members”. • New lintels and steel columns would be required to support the roof. • Existing steel trusses also need structural reinforcement. Comments Off on CAULFIELD PARK CONSERVATORY – Gone?? ?